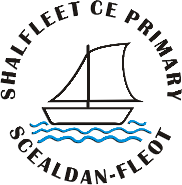 The Federation of Church schools of Shalfleet and Yarmouth School’s Governing body applies the Local Authority regulations on admissions fairly and equally to all those who wish to attend Shalfleet C.E. Primary School. The School Standards and Framework Act 1998 introduced a new framework for school admissions as of September 2000. This policy conforms to the regulations that are set out in that Act and also further explained in the statutory School Admissions Code of Practice and the statutory Appeals Code of Practice. We are an inclusive school that welcomes children from all backgrounds and abilities. The only restriction placed on entry by the LA is that of number. It is our wish to allow parents the right to have a place at this school, however this is not always possible, due to the excess demand on the places available. Applications are made directly to the LA. The level of ability of a child or any special needs that s/he may have plays no part in the admissions policy of this school. The school has a Christian foundation, but factors such as church attendance play no part in the admissions process. In this area, children enter school in the academic year they become five. There is one admissions date per year, early in September (i.e. at the start of the school year). Therefore parents who would like their child to be admitted to this school during the year their child is five should ensure that they complete the necessary application form by the stated date of the previous school year to register their child. Once registered with the school it is possible however to vary the date of actual admission according to need and in agreement with our on site Pre-School. The standard number is the number of children the school can accommodate. Our standard number is currently 24 per year group. This number is kept under review by both the Local authority and the governors who can apply to change the number if circumstances allow.